Mars Hill Cycling is extraordinarily excited to announce our latest addition to the team. Lacey Douglas, a senior at Roosevelt High School in Des Moines, Iowa, will join our growing women’s team this fall. Lacey is an accomplished road racer, placing 3rd overall in the Iowa women’s Pro/1/2/3 rankings in 2010. 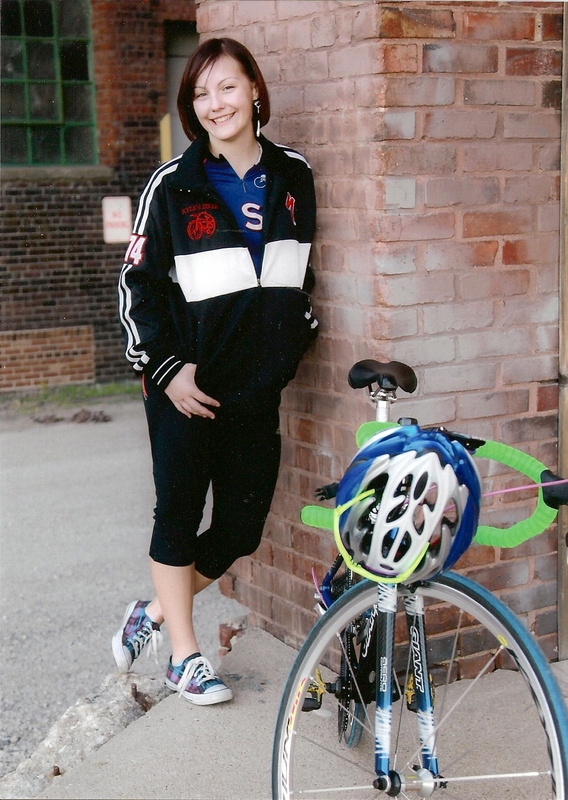 Lacey started riding at age 11 when she rode with her family in RAGBRAI, a 472 mile ride across Iowa. That experience motivated her to try racing and she’s been competitive ever since. Lacey also spent four years running cross country in high school. Outside of sports she enjoys fellowship with her church youth group. Lacey will likely make her debut with the team next fall during cyclocross season. Welcome to the team, Lacey! Seniors Paul Webb and Matt Willing led the TTT team to a conference title. Mercer University hosted the SECCC Championships last weekend on courses that were great preparation for upcoming nationals. After a one hour delay due to tornadic activity that sent us scrambling for the inner confines of a nearby Starbucks (the hotel next door had its roof blown off) the TTT was held in remarkably calm conditions on a 17-mile course that featured two turnarounds and a number of sharp rollers. 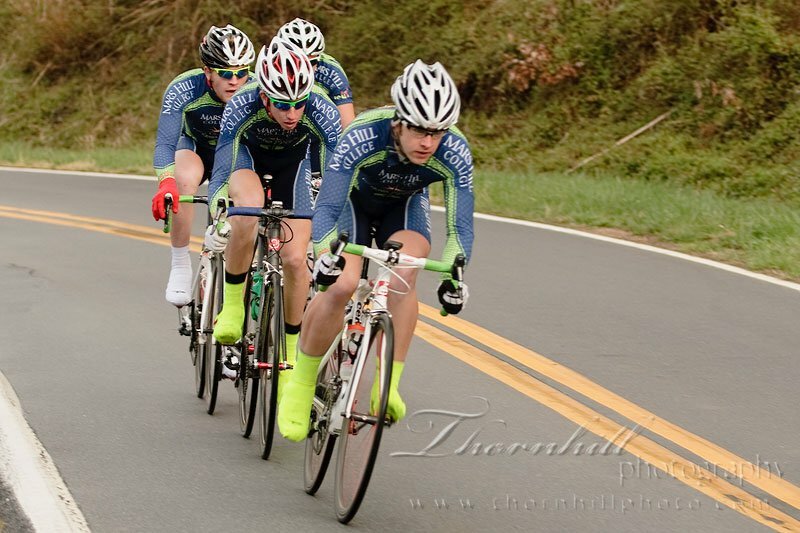 In the men’s A TTT, Mars Hill posted the fastest time in 37:09, bolstering hopes for a podium at nationals. Lees-McRae was just 16 seconds slower in 37:25. The LMC women’s team won their event over FSU. Steph Bunnett finished second in the individual time trial, which was won by Rachel Warner (LMC). Later that afternoon, the criteriums were held on a square 1km course around Tattnall Park, which was also host to an outdoor concert that added to the festivities. In both of the A races, impressive individual performances defined the day. In the women’s A event, Rachel Warner (LMC) escaped with Kimberly Flynn (UT-Chattanooga), both of whom eventually lapped the field. Warner then escaped again, this time with teammate Cinthia Lehner in tow. In dramatic last lap action, Warner lapped the field for a second time and helped Lehner get on even laps with Flynn and claim 2nd place. Steph Bunnett finished in 7th. In the men’s race, an early break of eight, including Paul Webb and Sebastian Scherf, escaped from an aggressive field of 48 riders. With a solid gap and most of the strong teams represented, the break looked to have staying power until Brian Sheedy (LMC) attacked and took off solo with 40 minutes remaining. Despite multiple chase and bridge attempts, an inspired Sheedy held a 20-25 second advantage until the end. Alejandro Padilla (Cumberland) outsprinted a 3-man chase for 2nd with Kyle Rohan (UF) in 3rd. Kyle Knott was 6th and Maitland Jones was 10th. 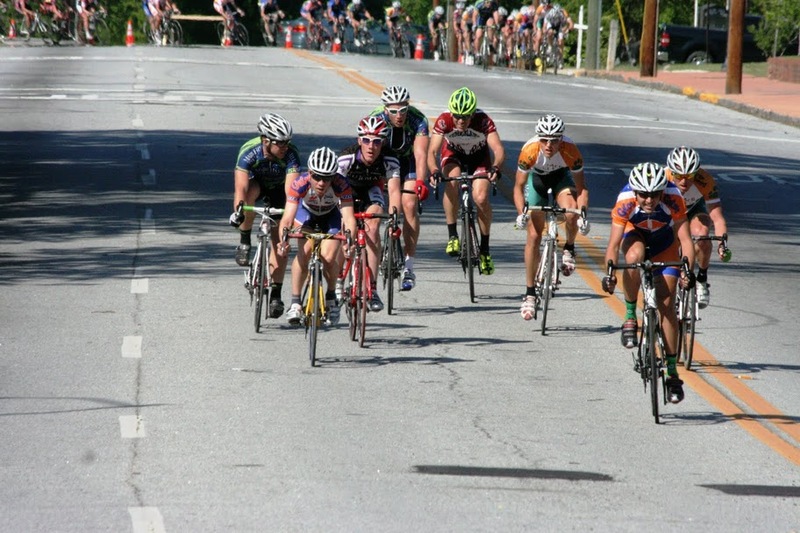 The early 8-man break in the mens A criterium. Photo courtesy of Andrew Lockwood. The road race was held on a 16-mile loop with a few short but challenging climbs. The women’s field splintered on the first lap and then Warner and Flynn again rode away, the former eventually taking the two-up sprint at the end. Lehner won the chase group for 3rd. Steph Bunnett flatted on the last lap but rode it in for 9th. In the men’s A race, a large 12-man break escaped on the last lap and came to the finish intact. Andy Baker (Furman) crossed the line first followed by Alejandro Padilla (Cumberland) and Michael Robinson (Mars Hill). Baker, however, was subsequently disqualified for an earlier centerline violation, moving Padilla into 1st and Robinson into 2nd. Paul Webb was 10th and Sebastian Scherf won the field sprint for 13th. Full results are HERE. Check for finalized season omnium results to be posted by Wednesday HERE. Next up are the national road championships in Madison, WI, May 6-8. Team selections will be announced soon. Big thanks to our sponsors for a great season. A special shout out to new sponsor Spin-Tech who has equipped the team with a trailer so we can haul more people and bikes to the races. Spin-Tech is a new cycling training center in Asheville where our athletes will have access to power, VO2 max, and LT testing. Check them out HERE. Tim Jenkinson tests the breakaway on one of the punchy climbs. In the final race weekend before conference championships, King College hosted a race weekend for both collegiate and open categories. The road race was held on the Tennessee State Championships course and was deceptively hard with several punchy climbs.The women’s A race saw current D2 national cyclocross champ Kimberly Flynn (UT-Chattanooga) sprint to the win ahead of breakaway companions Erica Zaveta (LMC) and Rachel Warner (LMC). Stephanie Bunnett (Mars Hill) won the group sprint for 4th. Elizabeth Ferguson (King College) was the first B woman. In the men’s A race, an 8-man break separated about halfway through with three riders each from Lees-McRae and Mars Hill. The College of Charleston and Georgia Southern were also represented. Peter Haile (LMC) took the breakaway sprint with Zach Felpel (LMC) and Paul Webb (Mars Hill) rounding out the top three. Trevor MacLean (LMC) won the B men, and Aaron Greenwell (GA Southern) the C men. The TTT, scheduled for late Saturday afternoon, was canceled due to lightening and tornado warnings, not too surprising for a race hosted by the King College Tornadoes. The weather then cleared and hit a sunny 85 degrees for Sunday’s crit at the Bristol Motor Speedway. On a technical .7 mile circuit, breakaways succeeded in every event. The women’s race was aggressive until Erica Zaveta (LMC) took off solo, eventually lapping the field despite an organized effort to bring her back. Rachel Warner (LMC) took off in the closing laps to claim 2nd. The A men’s race was a fiercely contested battle between Mars Hill and Lees-McRae, complicated when breakaway riders twice crashed and flatted while in the lead. In the end, the top two from yesterday, Haile (LMC) and Felpel (LMC) claimed those spots again. Michael Robinson (Mars Hill) was 3rd, and Kyle Knott (Mars Hill) won the field sprint for 4th. James Harnois (LMC) won the B men, and Casey Stollard (King) the C men. The Mars Hill race weekend went very well. A big, big thanks to all of the volunteers, supporters, and sponsors who made it run so smoothly. We couldn’t have done it without you. The new TTT and RR courses proved challenging and fun. And the weather was good despite some strong winds on Saturday. 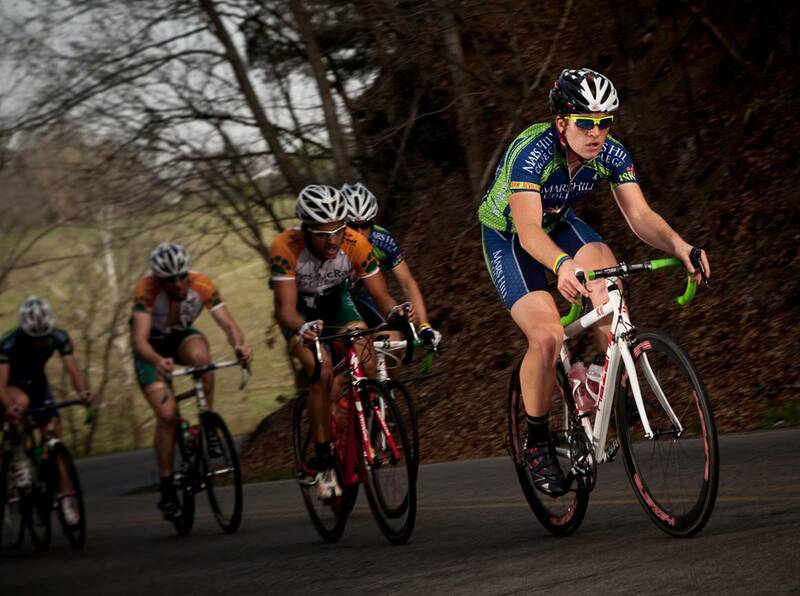 The Mars Hill men and women won their respective TTT’s. The men won by about 1:45 over Cumberland University. Brevard College was a close 3rd. The team is riding stronger every week as we look toward nationals and the TTT podium. The road race course separated the weak from the strong early on, with its relentless hills and wind gusts over 30mph. Matt Willing rode to a strong 2nd in the road race, which was won by Lees-McRae’s veteran pro, Brian Sheedy. Paul Webb finished a strong 4th. In the women’s race, Cinthia Lehner of Lees-McRae won. Steph Bunnett and Klara Rossouw were 4th and 5th. In the B men, MHC suffered its worst defeat by losing Mikey Keith for a few weeks due to a crash. Fortunately, no broken bones, but the shoulder will take some TLC before he’s back. Read his race report HERE. The C men suffered but finished strong. The criterium on Sunday was the same as last year, a 1 mile flat/fast course around the Biltmore Square Mall. Steph Bunnett jumped early in the women’s race but got pipped on the line and claimed 2nd. Rossouw was 3rd. Paul Webb made the winning break but was severely outnumbered and finished 5th. Kyle Knott won the field sprint for 6th after a strong leadout by the team. The C men put together a good race and Marco Liubenov earned his first top 10. Not far behind was Chandler Hill. Lots pics on our Facebook page. Following up on efforts to increase student exposure to outdoor adventures, Mars Hill administration announced yesterday that it will defund the cycling team in order to focus resources on creating the first ever collegiate zip line team. For those not familiar with zip lining, it consists of a wire strung between two trees that the rider glides across while hanging from a pulley. Situated on top of a hill and surrounded by trees, Mars Hill is ideally situated for zip lining. Motivated by the success of nearby Navitat Canopy Adventures–one of the top zip lining destinations in the world with 10 zip lines up to 1,000 feet long–Mars Hill will transition its cycling team’s riders and staff to the new team. Current cyclists will keep their scholarships and will be offered the first spots on the new zip line squad. Since Mars Hill will have the only zip line team in the nation, it will have a solid chance at the national championships, which will be organized by Mars Hill and is slated for next fall during leaf season. Starting today Navitat Canopy Adventures will begin its spring season. They’re located just 20 minutes north of Asheville. Look for the Mars Hill team zipping through the forest as they train and patiently wait for other schools to jump on the zip line bandwagon. For more info on zip lining, visit navitat.com.